Located in Oxfordshire 4 miles South East of Stow-on-the-Wold. The village of Bledington is in the broad valley of the River Evenload and is centred on a wide rough green complete with a small stream and noisy ducks. The 15th-century church is located on the southern edge of the green with a row of pleasant cottages overlooking the churchyard. There are fine roofs over the chancel and nave, a nice old doorway and original door, and above all a wonderful series of Perpendicular windows, several of which contain magnificent stained glass - believed to be the work of John Puddle, the Westminster craftsman who also produced the glass for Warwick's Beauchamp Chapel. Bledington lies on the Oxfordshire Way walk and taking this route you can walk westwards up on the wolds via Wyck Beacon and down to Bourton-on-the-Water, or south-eastwards down the valley to Bruern Abbey and onto Shipston-under-Wychwood. Located in South Warwickshire 3 miles North of Shipston-on-Stour. The Cotswolds hamlet of Armscote is an attractive mellow-stone village situated no more than three miles from the northern edge of the Cotswolds, Windmill Hill, above the village of Ilmington. 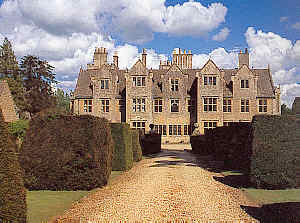 It has a fine Jacobean manor house, very Cotswold in flavour, and several no less pleasing houses of the same period. Armscote has no church, but there is an early 18th-century Friends' Meeting House with simple unspoilt interior. Armscote has a good local pub only 2 minutes walk away and a phone box. There are several small shops and a farm shop within 5 minutes drive and the market town of Shipston on Stour is 3 miles away with a range of butchers, fruit and vegetable shop, newsagents, delicatessens, banks and hairdressers. Located 2.5 miles North of Stow-on-the-Wold, Gloucestershire. Attractively sited village on a hill slope looking out eastwards over the broad Evenload Valley with a pleasant inn called the Coach and Horses. The church is of Norman origins with a 13th-century tower and a 14th-century south transept. This houses the very grand 17th-century monument to Sir William Leigh complete with his wife and children, and a monument to a 14th-century night and his lady, for whom this transept was probably built. The North transept , added after the demolition of nearby Sezincote church, is sealed off and houses the tomb of Sir Charles Cockerell, the builder of Sezincote. Local Attractions - Longborough Opera Festival (see Events Calendar). Sezincote famous gardens a few miles away. Located 4 miles NW of Chipping Norton and 4 miles NE of Moreton-in-Marsh. 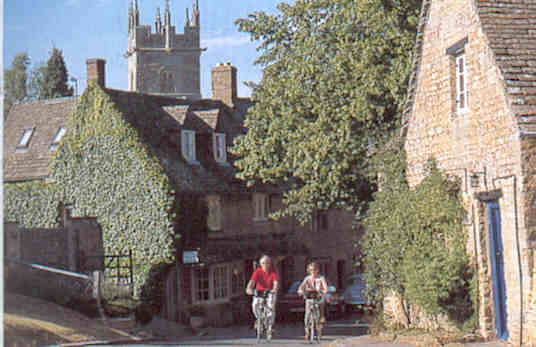 This attractive Cotswold stone village stretches out along the A3400 between Stratford-upon-Avon and Chipping Norton to the very foot of the long hill (occupied by the Rollright Stones) that climbs up over the Cotswold edge, across the county boundary from Warwickshire into Oxfordshire. The village has a cheerful inn, many trim houses and cottages, and an Anglo-Saxon church (the core of which is 13th-century), St. Peter and St. Paul, whose handsome perpendicular tower looks westward over a large bumpy field which was probably the site of the original ancient village. The church's lovely south porch is approached by a yew-lined path leading from a delightful 17th-century cottage on 'stilts' with lynch gate. The village in bygone days was notorious for witchcraft. Local belief in the power of witches continued until well into the 20th-century. In 1875, a Long Compton man slew one old woman with his sickle because he was convinced that she had caused the debilitating pains and cramps in his legs. Tradition says that in the 6th-century St Augustine visited the church and raised a man from the grave. The village of Mickleton lies in a fine setting immediately beneath the Cotswold edge overlooked by Meon Hill. 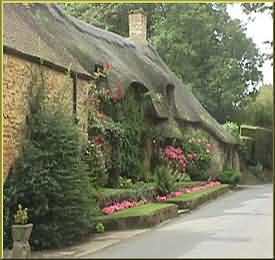 It has several attractive stone houses and cottages in addition to those of thatch and half-timber. The little Victorian Memorial Fountain close by the Three Ways Hotel (home of the Pudding Club) is an interesting feature by William Burges, the architect of Cardiff Castle and Castle Coch, two excellent examples of the High Victorian Gothic. Medford House (in picture below) is a handsome 'Cotswold-Queen Ann' style building and the church has a fine 14th-century tower and spire, and a most unusual 17th-century two-storeyed porch. Inside will be found a 12th-century crucifix or rood over the north aisle chapel alter. A nice circular walk leads up the hill from the church to Kiftsgate, Hidcote Manor Garden, and then up onto Ilmington Downs, before going down again through Hidcote Boyce to return to Mickleton. The is also a pleasant walk leading southwards, over the hill to Chipping Campden, passing close to the southern entrance to Campden Railway Tunnel. two pretty hamlets, passing two famous gardens open to the public. 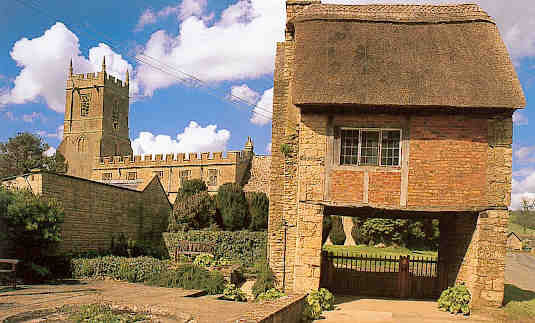 For comprehensive walking guide see - http://www.escapetothecotswolds.org.uk/userfiles/file/walks/jubilee/mickleton-and-the-hidcotes.pdf. 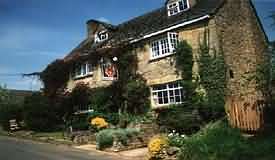 Located in Oxfordshire 4 miles North East of Burford, Oxfordshire. Once the near neighbour of Bruern Abbey, and once the centre of the Wychwood Forest, Shipton-under-Wychwood is built about a large village green in the Evenlode Valley. At the lower end of the green is St Mary's Church, begun at the end of the 12th century. 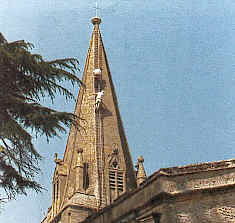 It has a fine octagonal spire growing out of its spire, whilst within the church there is a 14th century effigy of a decapitated woman and a Tudor monument of a family group at prayer. The apparently uniquely named Shaven Crown Hotel, a handsome building close to the green, can trace its history back to 1384 and was run at one time by the monks of Bruern Abbey. Bruen was a Cistercian abbey founded in the reign of King Stephen and dissolved in 1539 - nothing now remains. On the village green is a memorial of 1878 erected to 17 parishoners who died in a ship the Cospatrick which caught fire off Tristan da Cunha in 1874 on its way to New Zealand. Of the 477 passengers aiming to start a new life, only three survived. Pictures below - Shipton Court (typical Cotswold mansion) and St Mary's Church. Broad Campden is tucked away in a small valley, with woods never far away - a beautiful and exquisite little village with the majority of the old houses and cottages having thatched roofs. This village has to be one of the best in the Cotswolds. The village also has a small victorian chapel and an 18th Century Quaker meeting house with many of the original furnishings intact. Charles Ashbee converted a derelect Norman chapel into a house for himself soon after his arrival in the area in 1905. The Bakers Arms inn resides just to the edge of the village. The pretty Cotswold hamlet of Upper Quinton and village of Lower Quinton are situated in beautiful countryside on the edge of the Cotswolds. They boast a large green, no through traffic and is overlooked by Meon Hill - a local site steeped in witchcraft and folklore. Its sister village, Lower Quinton (15 mins walk), offers a range of amenities including a pub (serving food) and a selection of shops. It also has an impressive church steeple which is a landmark for miles around. Stratford upon Avon is only a short drive away and offers good shopping, historic buildings and three world famous theatres. 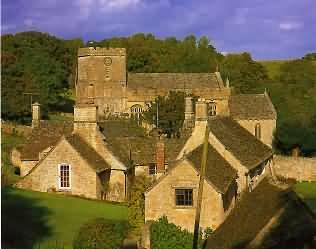 Occupying the sides of a deep valley, west of Fossebridge, Chedworth is an ancient village with a church dating from Norman times. Dedicated to St Andrew, the building is noted for its striking Perpendicular facade (including windows), constructed in the fifteenth century when the prosperity of the Cotswold wool was at its height. At the head of the wooded valley to the north-west are the remains of a Romano-British villa, Chedworth Roman Villa (now owned by the the National Trust). The site was discovered by accident in 1864, when a gamekeeper found fragments of mosaic and pottery in the vicinity of a rabbit warren. Subsequent excavations unearthed the foundations of a building complex dating from between early second century AD to the late fourth century AD. The mock-Tudor house and museum nearby dates from the Victorian period.